They Never Fail To Deliver... Starter Of: Pureed Roasted Sweet Potato Soup A Small Caesar and Poached Pear & Candied Walnut Salad. 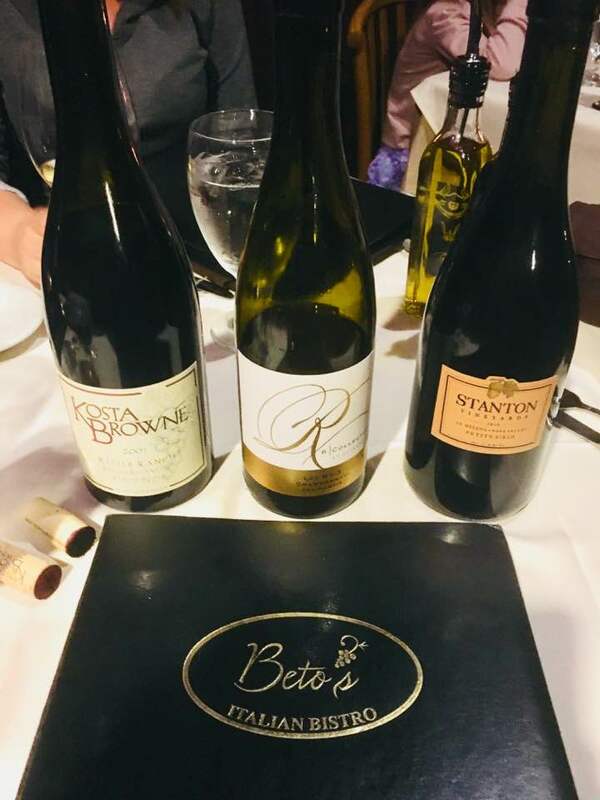 Paired With The R Collection Napa Chardonnay (Beto's Was Out Of Our Usual House Selection Of The Landmark Estate Sonoma Chardonnay)! Main Course Was Special Requests Of: Rigatoni With Salmon & Shrimp With A Vodka Cream Sauce; Chicken Parmesan Paillard & Crispy With A Tomato Cream Fettuccine Over Roasted New York Steak (Med-Rate) W/ A Mushroom Cream Sauce & Spinach Mashed Potatoes All Three Were Perfectly Done And Super Yummy! Wine Pairings We Brought For Dinner Were Up To La Cucina Della Notte: 2007 Kosta Brown "Keefer Ranch" Russina River Pinot Noir ($150-200). We Can No Longer Afford The Newer Single Vineyard Kosta Brown Pinots - So Every-time We Open One Of These From Our Library Is Special Indeed... A 10-Year Old Pinot That Is Still Showing Classic Garnet Red Color.. Notes And Flavors Of Bright Red Cherry Fruit W/ A Touch Of Cola & Truffle-Earth. Wonderful That This Pinot Is Retaining A Bit Of Acidity That Pairs Well With The Cream Sauced Pastas And Creates A Pleasant Lingering Finish That Will Have Any Pinot Lover Smiling! 2009 Stanton St Helena Petite Sirah ($$45-55 Retail) - For Orin Swift Fans, Make No Mistake; This is Dave Phinney's Best Petite Sirah! A Special 350-500 Case Project He Makes For Winery Owner And Grape-grower Doug Stanton. Dark Indigo In Color - With Huge Notes And Flavors Of Blackberry, Blueberry, Licorice, & Black Pepper. Large But Supple Tannins Provide A Seemingly Unending & Immensely Pleasant Finish Made Sure That Staff Was Able To Share A Glass Or Two Of Each During The Course Of Our Dinner... A Nice Night Of Dinning Out Finished With Orders Of Cappuccinos & A Shared Baked Cinnamon Crisp With Vanilla Gelato... A Wowwie Night Of Dining Indeed!